Due to rapid enrollment growth and the subsequent need for on-campus housing, the university planned a dedicated facility for housing administration. Comprising approximately twenty thousand square feet, the building includes forty private offices, five open office areas, and four large meeting rooms. The design integrates numerous “touchdown” spaces throughout the building to foster an environment of social and collaborative interchange. 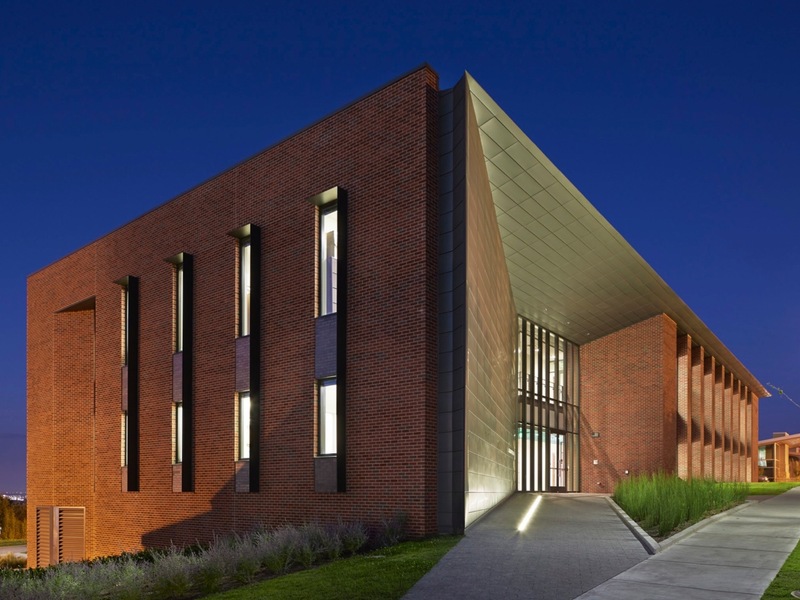 While the building serves an administrative function, a primary objective was for it to serve as a welcome center and front door to students and families visiting the campus. Located in the Rose Hill Neighborhood - central to residence halls and visitor parking - the site is north of the Historic Core, allowing the building to adopt the more Modern sensibilities of its neighboring context. Conceived as a background building, and ultimately unable to occupy the west corner of the block, the design responds in a restrained way by subtractive manipulation of the south and east facades. Public entry porches are physically carved from the building volume, creating a more intimate entry sequence that’s inviting for pedestrians yet shielded from neighboring structures. The edge of this incision - realized in plan and section - is defined by a folded ribbon of zinc that runs uninterrupted from the south entry to the east facade. A continuous ribbon of blue tinted glass repeats this concept at interior public spaces. Though not authorized for certification, the building integrates numerous sustainable attributes and features.